Welcome to the April 6, 2018 edition of ACM TechNews, providing timely information for IT professionals three times a week. Researchers at the University of Hawaii and colleagues have examined how scientists involved in human-computer interaction apply science fiction concepts to their work, and determined sci-fi's influence on research is growing. The team contends sci-fi movies, shows, or stories do provide an inspiration for the foremost and upcoming human-computer interaction challenges of our time, for example, through the discussion of shape-changing interfaces, implantables, or digital afterlife ethics. Their work will be presented this month at the ACM Conference on Human Factors in Computing Systems (CHI 2018) in Montreal, Canada. "We speculate that the explicit referral of sci-fi in human-computer interaction research represents a fraction of the actual inspiration and impact it has had," the team notes. There also is evidence that technology companies increasingly employ futurists who use science fiction as a medium for investigating potential new technologies and their social effects, a practice they call science fiction prototyping. Researchers at the Massachusetts Institute of Technology's (MIT) Computer Science and Artificial Intelligence Laboratory have developed "Squadbox," a crowdsourcing tool that lets victims of online harassment coordinate "squads" of friends to filter messages and support them during attacks. "Squadbox allows users to customize how incoming email is handled, divvying up the work to make sure there's no duplication of effort," says MIT Professor David Karger. Squad "owners" can set up filters to automatically forward incoming content to Squadbox's moderation pipeline. Once an email arrives, a moderator decides which emails constitute harassment, and which can be forwarded back to the recipient's inbox. Users also can create "whitelists" and "blacklists" of senders whose emails will be automatically approved or rejected without moderation, and they can deactivate and reactivate the system, read scores on messages' toxicity, and respond to harassers. The work will be presented this month at ACM's Conference on Human Factors in Computing Systems (CHI 2018) in Montreal, Canada. Australia's Pawsey Supercomputing Center has signed a memorandum of understanding (MOU) with the National Supercomputing Center of Singapore so that both facilities can collaborate on supercomputing, networking, data analytics, scientific software applications, and visualization. Pawsey says the goal of the agreement is to deliver "better, faster, and more innovative" scientific outcomes for the benefit of Australia and Singapore. The MOU is expected to facilitate the flow of knowledge between both centers, and Pawsey notes such knowledge transfer will subsequently work to the advantage of each nation's high-performance computing community. "The two supercomputing centers will collaborate in areas such as strategy, best practice, and shared experiences in planning, defining, administering, and supporting industry engagement, outreach activities, training, and stakeholder management," Pawsey says. The facility also notes the partners have plans that include joint projects to optimize researchers' activities, including training and code optimization. Researchers at Fraunhofer-Gesellschaft in Germany have developed a new cognitive system for the predictive maintenance of production facilities. They say the new system involves intelligent battery-powered acoustic sensors that process audio signals from machines and systems in real time. The data produced by the system can be used to draw conclusions about the condition of the production facilities and avoid possible damage. The researchers mounted battery-operated sensors on axial piston pumps, and recorded the noise of the pumps through the air. The sensors processed the noise, compared it with reference audio data, and sent the results wirelessly to a digital evaluation unit. Not only can conclusions about possible undesirable developments be identified at an early stage, but statements about the nature of the problems also can be made. "We have trained the cognitive system with machine learning based on previously acquired pump audio signals," says Fraunhofer's Danilo Hollosi. 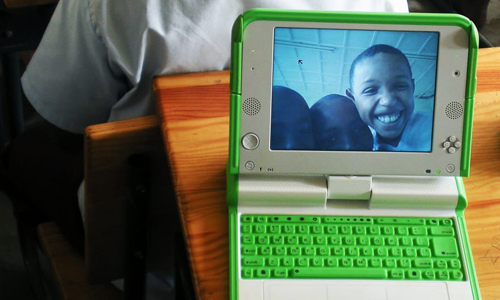 Four years after the rollout of the One Laptop Per Child project in a village in Madagascar, researchers found the use of computers in low-income countries encouraged formal and informal learning activities at home, providing easy access to information, educational games, and tools for self-expression. The sponsors supplied laptops and technical, logistical, administrative, financial, and educational support, with the products given to 160 children between five and 15 years old and enrolled in the village's primary school. The laptops were used quite differently at school and in the children's homes--at school, they were generally used to learn about word processing, to play educational games, and to support creative activities, as well as a virtual learning environment. Meanwhile, at home the children mainly used the laptops to take photos or make videos, listen to music, play games, share content, and do homework. Especially striking in Madagascar was computer use being a collective instead of an individual practice. Researchers at the University of Cambridge in the U.K. and the University of Helsinki in Finland have created an online psychometric tool, called Susceptibility to Persuasion II (StP-II), that measures a range of personality traits and identifies individuals who are more likely to be victimized by cybercriminals. The tool asks participants to answer questions in order to measure how likely they are to respond to persuasive techniques. "Elements of consumer psychology and behavioral economics all come into the design of an online scam, which is why it's useful to know which personality traits make people susceptible to them," says Cambridge professor David Modic. The questions used in StP-II fall into 10 categories, measuring different traits that might make people more susceptible to fraud, including the ability to premeditate, consistency, and sensation seeking. The researchers found the strongest predictor was the ability to premeditate, meaning individuals who fail to consider the possible consequences of a particular action. Ohio State University (OSU) researchers have explored the mixture mechanics of quantum fluids, using a supercomputer to model the combination of two magnetically polarized Bose-Einstein condensates (BECs). They noticed the formation of blobs resembling a turtle, then a frog, and then an explosion of mushroom shapes. The researchers think the simulation offers clues to phenomena that physicists have observed in experiments. Experimentation has demonstrated that BECs exhibit weird properties because all the atoms occupy the same quantum state. 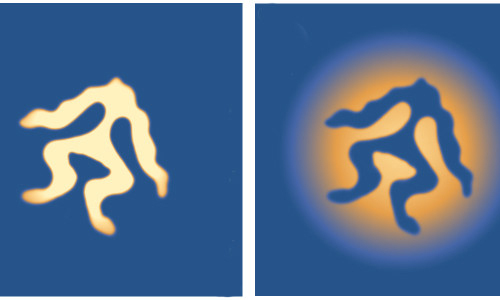 Although BECs should flow together with no viscosity, adjusting the parameters of the simulation showed the fluids combined as if one was more viscous than the other. OSU's Kui-Tian Xi says current technology would enable experimental physicists to perform the simulated experiment for real, while he will concentrate on the possible implications of an increasing linkage between the behavior of quantum and classical fluids. A team of researchers led by the University of California, Riverside (UCR) exposed a vulnerability of both Intel central-processing units (CPUs) and an Intel software guard extension enclave. The researchers demonstrated a new type of branch predictor attack that was significantly different in form, intent, and execution to both the well-documented Meltdown and Spectre attacks, and therefore require immediate restorative and protective action from manufacturers. "Despite patches which were rolled out to combat earlier attacks, like Spectre, in January 2018, we believe BranchScope can still read data that should be protected, and is capable of defeating address space randomization," said UCR's Nael Abu-Ghazaleh. He noted BranchScope enables the attacker to pollute the branch predictor and control the victim's branch outcome, which is a capability similar to that of Spectre 2. "It is critical for CPU manufacturers to close vulnerabilities such as this that enable attackers to control speculation," Abu-Ghazaleh said. Intel responded by working with the researchers to determine the best approach to mitigating the vulnerability. Due to significant advances in technology, graphics-processing units (GPUs) are governed by a law similar to Moore's Law, according to Nvidia CEO Jensen Huang, who highlights the fact that Nvidia's GPUs today are 25 times faster than they were five years ago. He notes if GPU technology advanced according to Moore's Law, it would only have increased its speed by a factor of 10. Huang also discusses the increasing power of GPUs in terms of the time to train AlexNet, a neural network trained on 15 million images. He says five years ago, it took AlexNet six days to complete the training process, but today it only takes 18 minutes. Huang emphasizes that GPUs need a law of their own, given that they benefit from concurrent advances on multiple fronts, including architecture, interconnects, memory technology, and algorithms. 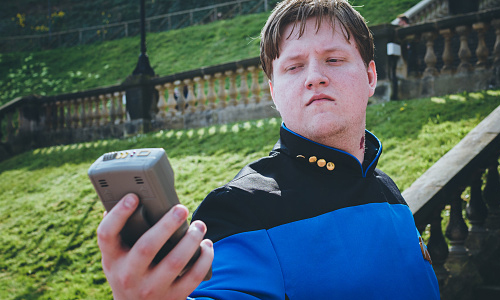 "The innovation isn't just about chips," he contends. "It's about the entire stack." Stanford University researchers have demonstrated correlations between linguistic changes in gender and ethnic stereotypes and social movements and demographic trends in U.S. Census data over the past 100 years. They used word embeddings--an algorithmic method that can map relationships and associations between words--to quantify those changes. These embeddings identified specific occupations and adjectives that were biased toward women and especially ethnic groups by decade from 1900 to now. The team trained those embeddings on newspaper databases as well as embeddings previously trained on other large text datasets. Their research showed that changes in the embeddings tracked closely with demographic shifts as measured by the U.S. Census. University of California, Los Angeles researchers have developed sclmpute, a computational tool that increases the reliability of measuring how strongly genes are expressed in an individual cell. The new tool is statistical analysis software for handling dropouts in RNA sequencing. The researchers say sclmpute estimates which genes in a cell are mostly likely to drop out based on studying all the individual cells in an experiment, and then it uses information from similar cells to make an educated guess about what the level of gene expression should be. The new system is more precise than previous software, replacing only abundances that have most likely dropped out and can be used in any type of single-cell gene-expression analysis. During testing, the researchers found that sclmpute reliably distinguishes dropout genes from those that are not expressed at all, and it also provides accurate estimates of the actual abundances. Computational biologists at New York University (NYU) have developed an algorithm that can "align" multiple sequencing datasets with single-cell resolution. This approach can improve understanding of how different groups of cells change during disease progression, in response to drug treatment, or across evolution. The researchers modified analytical techniques specialized at finding shared patterns across images. In a repeated bone-marrow analysis, the researchers found that the same cell populations consistently appeared. Analyzing a dataset of human immune cells stimulated with interferon, the team pinpointed genes that were switched on in each of 13 responding cell types. The team also integrated single-cell datasets of pancreatic tissue from humans and mice, identifying 10 shared cell types and defining the evolutionary changes occurring in each group. In the future, the researchers plan to apply their approach to study cellular drug responses in clinical samples, and to make their methods widely accessible. Researchers at the Technical University of Denmark and the IT University of Copenhagen are developing Wi-Fi applications to identify and monitor people moving within a building covered by a wireless network. In one concept, a Passive InfraRed (PIR)-based surveillance system is divided into an infrared sensor and a wireless communication component. The PIR sensor can measure the heat radiation from an intruder and convert these measurements into a digital signal, which is sent through the wireless network to the main alarm unit. If the changes in heat radiation are sufficient, an alarm is triggered. This system can be reconfigured by removing the infrared sensor and keeping only the wireless communication units. In this arrangement, the intruder is identified by changes in radio frequency signals exchanged between the two communication units. In addition, certain radio frequency waves propagate through walls, enabling detection of intruders in another room. Fifty-five percent of science, technology, engineering, and math (STEM) classroom interactions consist mostly of conventional lecturing, a teaching style prior research has identified as among the least effective at teaching and engaging students, according to a University of Nebraska-Lincoln study. The study found 27 percent of respondents featured interactive lectures, while only 18 percent emphasized a student-centered style heavy on group work and discussions. One reason a majority of faculty continues to use ineffective teaching methods is a lack of training for taking advantage of smaller class sizes, open classroom layouts, and other strategies meant to reduce the reliance on conventional lecturing. 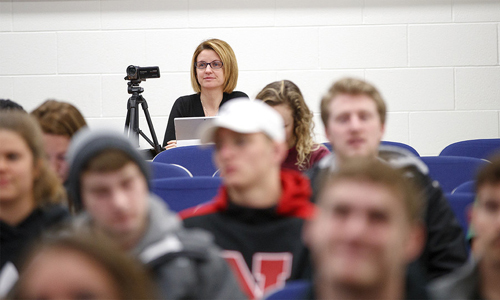 "There is an enormous amount of work that has demonstrated that these [student-centered] strategies improve students' learning and attitudes toward science," says University of Nebraska-Lincoln professor Marilyne Stains. "It's not just that they understand it better, but they also appreciate science more. They're not as scared of it, and they engage more easily with it."